Beta Marine customers span the do-it-yourself sailor through to mainstream boat manufacturers. Our most frequently seen customer is usually replacing an old engine - such as an Atomic 4, Volvo, Yanmar, or a variety of discontinued gas or diesel engines. We have a variety of mounts to match just about any marine repower requirements you may have. Checkout the Applications tab above to learn more. Our customers appreciate the dependable Kubota-based design that delivers a smooth-running, compact, reliable, easy to maintain and cost-effective solution for their marine diesel needs. Tom Mitchell owns a Newport 41, that had a Westerbeke 42 he wanted to replace. Beta Marine Northwest worked with Tom to do a careful analysis of his requirements. 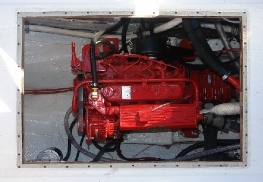 Tom ended up ordering a Beta Marine diesel model BV1505, along with a a 100 amp alternator upgrade, a C Panel upgrade and an adapter to mate to his existing V Drive. We also provided special mounts that allowed Tom to seat the engine on the old Westerbeke footprint. Q Tom, why Beta Marine? What other engine manufacturers did you look at and what was it about Beta Marine that made the difference? What were the top features/benefits that were important to you? 1) The core Kubota engine which is widely known and easily serviceable. 2) The Beta marinization was the best we saw and had some features like the oil change pump that none of the others had. 3) We also liked the larger alternator, the simplicity of the engine and how well thought out each component was. 4) The readily available custom mounts were also a big factor. 5) We wanted to have a relationship with the manufacturer that would support our re-power effort. 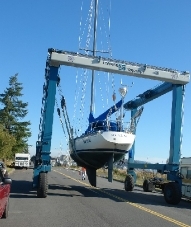 Of all the people we talked to Beta Marine Northwest exceeded our expectations." Q What did you like best about the experience of working with Beta Marine Northwest? A "You were extremely helpful and supportive and took a completely “solution oriented” approach throughout the process. The re-power, integrating with the old V Drive, had its challenges and you exceeded our expectations in helping solve each one. We felt like we got a complete working solution to our engine problems and that we now have a superior engine installation." Q Would you recommend Beta Marine to others who are repowering their boat? A "Absolutely! We would be happy to provide recommendations/references to anyone. Please feel free to provide our contact information to anyone considering Beta." Q Now that you have a new Beta Marine diesel installed, how is it performing? A "Our partners were on the boat for 12 days and everything with the Beta worked great. We spent last weekend on board and the engine ran well. We are at 27 hours at this point. Performance has been really good. 2,000 RPM pushes the boat at about 6.5 to 6.7 knots and 2,200RPM gets us up to just a little over 7 knots. The engine is smooth and considerably quieter than the Westerbeke. We have a lot less vibration. By the way, the Kiwi prop has been awesome as well. Great reverse. Under sail, we have picked over a knot of boat speed. We are hoping to get out again this coming weekend, weather permitting."